There is a growing numer of wines that are produced by smart wine marketers. These have no particular vineyard as their source but are the product of what are called Negociants in France. Wine makers who buy grapes, vinifie and bottle and sell under their own name. The result, very often, is good inexpensive wine with very colorful labels. Recently I tried a pair of Chardonnays. Planning a Halloween party or looking for something to sip while waiting for trick or treaters? 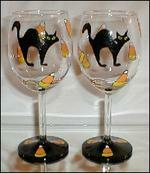 Hand painted Halloween Glasses from Eye For Gifts. Considering the many times I have dined at or taken out from Greek Delights, I was surprised to see I had never written a review. Had lunch there last Saturday with my daughter, Nell, and her boyfriend, Kris. It was delicious as usual. Attended the opening of Art To Be Square the new product line of Art Industries, Montclair. An array of exciting new art decor objects, all custom made, were shown. Wine from Amanti Vino and desserts by Dinners Done and other goodies were enjoyed. When Fascino opened 3 years ago I was just so done with upscale restaurants. David Corcoran's, NY Times, excellent review intrigued me, but other mixed reviews discouraged making a trip there. A couple of weeks ago a dining friend insisted we try it. It is one of her favorites so we said great lets go. Armed with two fabulous Italian wines we were looking forward to a great dinner. My son and his friends have been playing Soccer at Watsessing Park in Bloomfield. We enjoy watching the games, his team and others who play there. In the warm weather the park is quite a family and friends social scene. A few blocks away is the great Mexican restaurant Senorita's. We have dined there a few times and have been happy on each occasion. 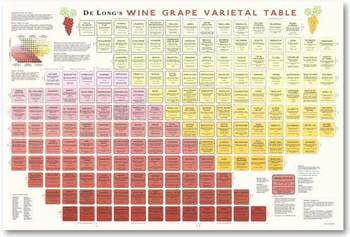 Wine Library presents great diversity in wine selection. Wine from many countries and unusual grapes that you don't find in many stores. Here are two examples from the Ligurian section of Italy. A Pigato and a Bianchetta Genovese. Here is the ultimate gift for you, your favorite wine geek, or just anyone intrigued or passionate about wine. I find it an indispensable guide to wine.